February 26, 2015, 2:50 PM · It's not surprising to see in person that violinist Arnold Steinhardt has a way with words. Steinhardt, who is a professor of violin and chamber music at The Colburn School, University of Maryland, Bard College and the Curtis Institute, also does a great deal of writing. He has his own blog called In the Key of Strawberry, and he has written two books, Indivisible by Four: A String Quartet in Pursuit of Harmony, about his journey as first violinist in the Guarneri String Quartet (which disbanded after 45 years in 2009); and Violin Dreams, more generally about his life as a violinist. 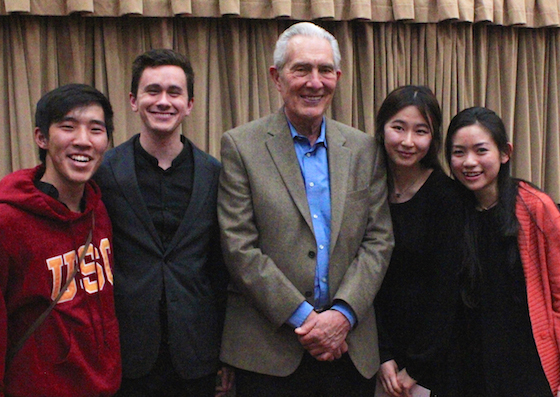 Steinhardt's gift for description was on display during a chamber music master class Friday night at the University of Southern California, during which he coached three student chamber groups for an audience of about 50. Smiling as he spoke, Steinhardt offered his suggestions with clarity and appeal, in language both efficient and richly meaningful. The first quartet set the bar high, with an energetic performance of the first movement of Mendelssohn's String Quartet, Op. 44, No. 2. It's a movement full of fast unison runs, and their playing was satisfyingly on-pitch, in time, and marked with awareness for one another. "You really captured the essence of this piece, the emotional intensity," he said after their initial performance. He suggested to the first violinist that her sound in the opening would have "more spin" if she could use more bow. He did not want to change the volume, just the quality of the sound. "If you use more bow, the sound has more wings," he said. In another passage, he wanted a note emphasized, but not with an accent. "Could you give it a little more of a heart pang?" he said, suggesting the use of vibrato rather than any change of bow stroke. He asked the first violinist to really go for a high note, and when she overshot it, he applauded the effort. "You took a chance and you went for it, and I think that's really important," he said. 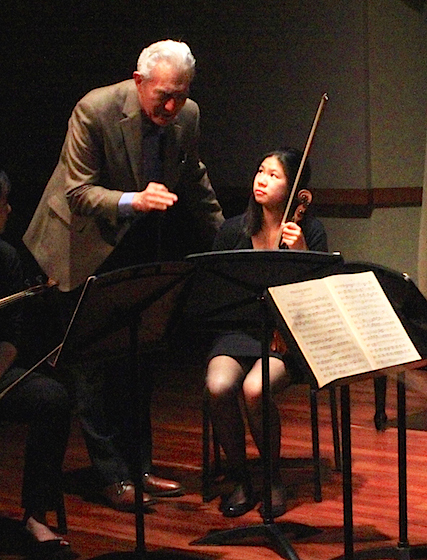 He quoted Heifetz: "Practice as if the whole world depends on it; perform as if you don't give a d*mn." In order to get a little more volume from the second violinist, Steinhardt reminded her that "you're two yards back from the first violin, so you have to push just a little harder." He suggested that it's possible to change color by changing strings, so plan fingerings accordingly. "You don't have to work hard to change the color if the string has done it for you," he said. He advised them to "work harder in clearing the thick texture." The density of Mendelssohn's writing offers a challenge: in order for the important lines to emerge, one person needs to get louder while the rest get softer. "How much do you want to be out of the water?" he asked. "You are only this much out of the water," he said, holding his hand like a waterline, up to his nose. He lowered it to his chest, "You want to be a least this far out of the water. Take a chance in doing too much," he told the cellist. "Too much" ended up being just right. Steinhardt noted a place in the cello part, where Mendelssohn puts a "fancy curlicue" on the second iteration of a repeated figure -- "put a little rubato on it so that it sounds like you are improvising it, like you got tired of the first way and just made up something," he said. For an ascending flourish in the first violin, he advised her to play it with a little more flair, referencing one of our more showy violinist-composers: "put a little bit of Wieniawski in Mendelssohn!" 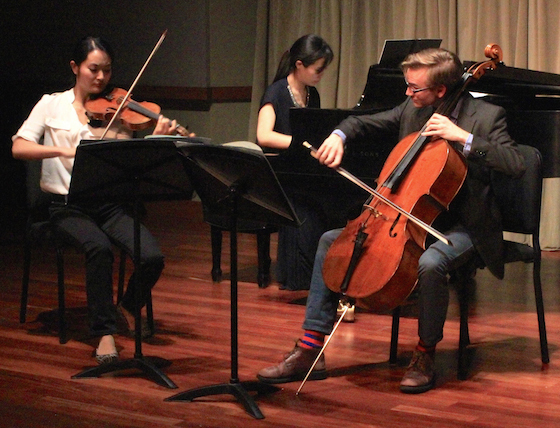 Next, a trio performed the first movement Ravel's piano-violin-cello Trio in A minor, an atmospheric and mercurial piece, ranging in texture from rumbling low chords to icy-high harmonics. I must add: it was really a pure pleasure to hear every one of these accomplished student groups perform. They'd already achieved a high level, and then they responded to Steinhardt's suggestions wholeheartedly, with immediate effect. For this piece, Steinhardt focused on staying true to the composer's tempo markings. "If it's too slow all the time, it gets to be formless," he said. Though it's not necessary to time everything exactly to the metronome marking, it is important to obey the relationships between the various tempo markings. "It's so gorgeous, the temptation is to play it slowly," but it needs motion. "Keep the flow, even though you want to pick a few daisies here and there. Don't pick too many daisies," he said. He focused on where to move forward and where to hold back in the movement. And here's a little trick: speed up just a bit before a place where you are supposed to slow down. "If you have a ritard coming up, it's more interesting if you move a little into the ritard," he said. If the composer asks for a long slow-down, be sure to start the passage fast enough so that the slowing will not feel like dragging. "You have to cook up your own recipe here, but it has to have fluidity," he said. Another quartet played the first movement of Beethoven's String Quartet No. 11, Op. 95. As they played it, something seemed a little disorganized to me, despite good playing. What was it? Steinhardt identified it easily: it needed more speed. "If you pick a tempo that's not quite right, no matter how well you play, the tempo ends up being your enemy," he said. This movement should be "bubbling," he said, but at a slow tempo, it gets too note-y. At a faster tempo, "even if you play it badly, it's going to sound pretty good. It's going to be a lot easier to capture the essence." Sure enough, a faster tempo tightened the music and improved the overall effect. His other suggestions were about balance: the beginning of this movement has all four instruments playing in unison, and when this is the case, it's not necessary to dig in quite so much. "You can cool it a little," he said, "otherwise the danger is that you are going to lose your good sound." In places where the violins play in octaves, the lower octave should really sing out to balance the voices, as the higher octave will automatically sound louder because of its favorable range. When it comes to pressing for sound, the cello and viola can press and still sound nice, but "if you two press," he said to the violins, "it's going to scream!" February 27, 2015 at 03:55 PM · What a great column, Laurie! I felt as though I was right listening to Arnold's words and inimitable style of coaching. Your reporting is just right... taking in all that's right without any self-enhancement that some reviewer /journalists can spread on top of the real moment! February 27, 2015 at 04:18 PM · Arnold Steinhardt has always been a violinist/musical hero to me. I loved reading this! February 27, 2015 at 11:45 PM · Years ago, Mr. Steinhardt graciously gave me of his time to hear my rendering of the Bach Chaconne at his New York apartment. His private master class laid out some keen observations in my technique, and his artistic input was useful and very much appreciated. I also walked away very much touched by his courteous demeanor. He can be feisty in the musical performance (when the music calls for it), but socially the man has a graceful heart. March 1, 2015 at 01:54 PM · As I mentioned in my most recent blog, A Violin Double Header, I had an unplanned meeting with A.S. not long ago and found him to be quite nice and down to Earth.